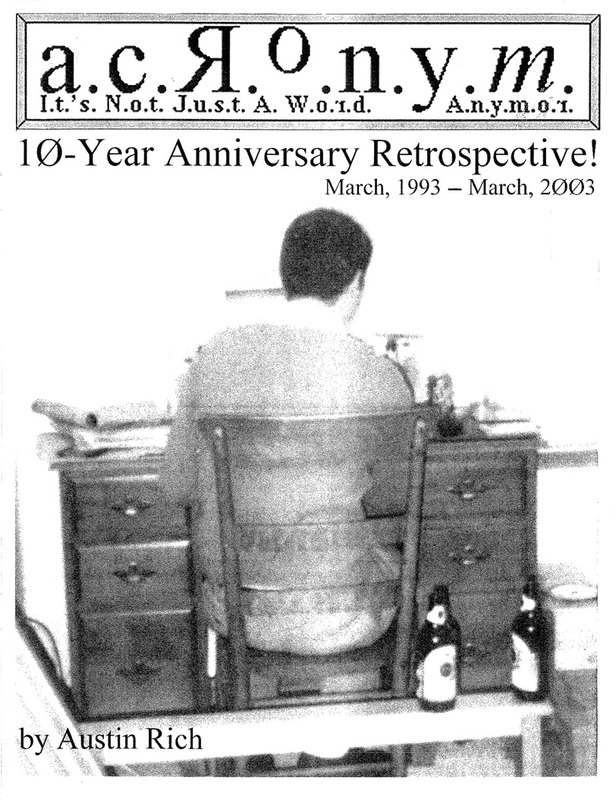 March 2003 – ACRONYM Inc.
For the first time since the original release in April of 2003 – which was only available as a limited run at the time, and then disappeared completely shortly thereafter – our 10-Year Anniversary Retrospective is now available again! This 8 1/2″ x 11″, magazine-sized publication is over 180 pages of A.C.R.O.N.Y.M. related text and images from the early days of this humble publication. Containing excerpts from High School publications, all my one-shots, and material from the two regularly-produced publications (A.C.R.O.N.Y.M. & I’d Buy That For A Dollar), this monster of a publication is available in its second edition physically (print on demand), and for the first time ever, digitally! Half biography, and half “best-of,” this collections was one of the last things I assembled before I turned toward school and radio in a very big way. While much of the material makes me flinch now, this collection took nearly a year to write and assemble, and then experienced a very short shelf-life before it went out of print later that same year. Technology and time-constraints have prevented me from getting this back into print, so we are extremely excited to offer this again, and for digital readers, for the first time! If you are the kind of person that likes to watch someone stumble and stagger during their earliest days of wrestling with the written word – and more importantly, if you enjoy people who put their feet in their mouths on a regular basis – then this is the publication for you!